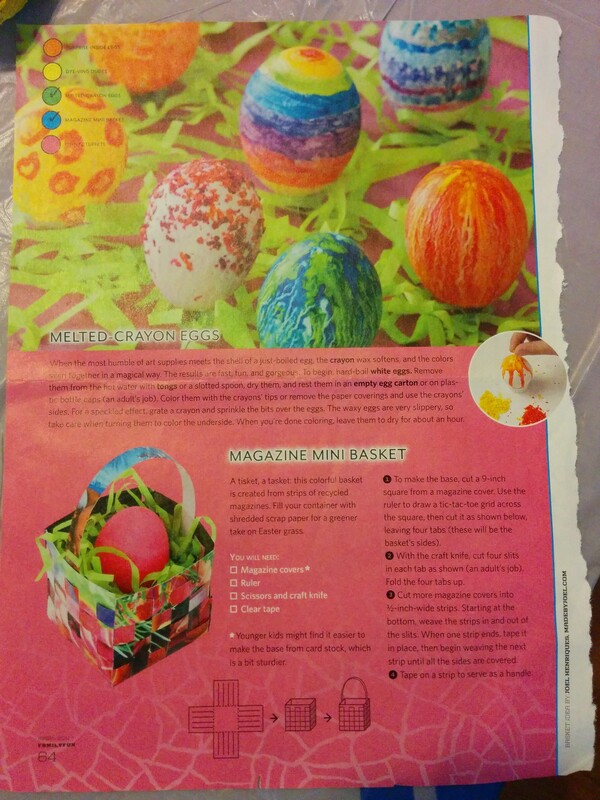 Way back in 2011, someone sent me an issue of Family Fun magazine that included this idea for coloring Easter eggs. The basic idea is that you color the eggs with crayons while the eggs are still hot so that the wax melts onto the egg. The article also suggests sprinkling crayon shavings onto the hot eggs. 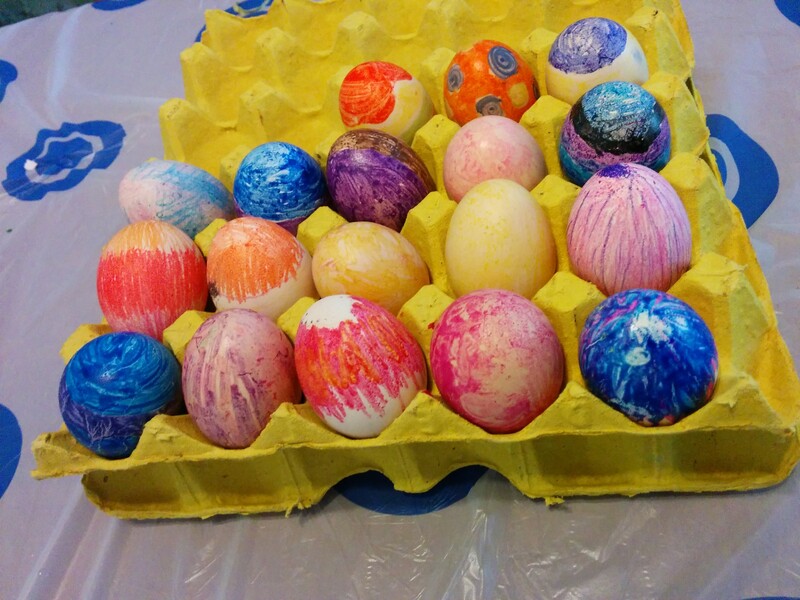 This year, we happened to have a bag of stray crayons, and did not have an Easter egg dye kit, so the time was ripe to try this idea out. We ran into a few hiccups along the way, but for the most part, I think it was a very fun, successful Easter egg decorating adventure. Hiccup #1: Running cold water over the eggs to stop the cooking. I normally do this as the last step of boiling eggs, and the eggs are usually still warm/hot after this step. Sadly, it turned out this step cooled the eggs too much, so the first couple eggs we colored weren’t a success. 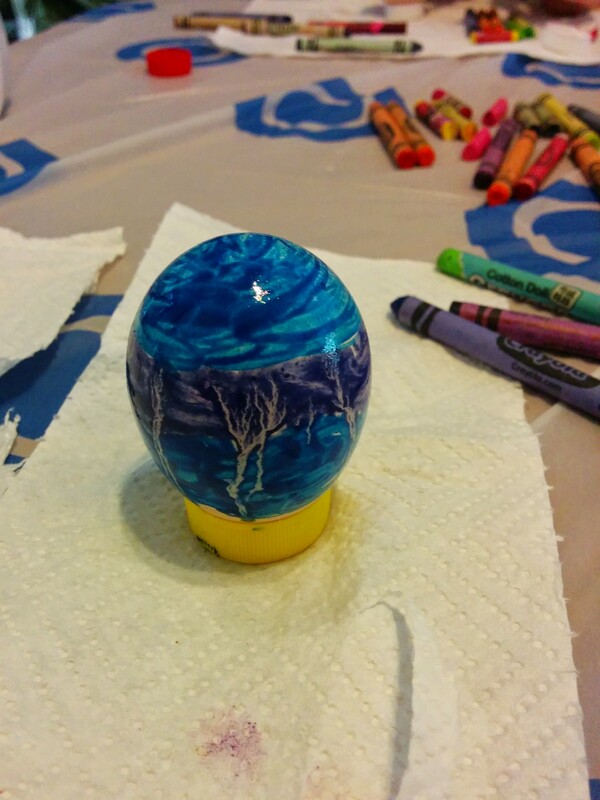 It felt more like simply coloring on an egg than having the colors melt on. Next time, I’ll skip the cold water step and just risk over-cooked eggs. This time, I put the rest of the eggs back into the pot with some water, then turned the stove on as low as I could get it, so it wasn’t even really simmering. We took the eggs one at a time to the table with tongs, briefly dried them on a paper towel, then set them on little bottlecap stands and got to work while they were piping hot. That worked better – the wax melted really well once the crayon tip got hot enough. Beautiful colors and patterns emerged! There was quite a bit of frustration, though, on the part of certain underage minors. The eggs were quite hot, as they needed to be, but that meant not being able to hold them steady with bare fingers. It was also hard to keep them on their little bottlecap stands. Several Humpty Dumpties got cracked from their falls. One rolled across the table and splatted onto the floor. Good thing we have tile; wax would be a bear to get out of carpet. Frustration was building, and there may have been some tears. At this point, I was thinking, we are NEVER doing this again. And then I thought, we are SO doing this again. Anyway, I would NOT try this with younger kids, but it’s pretty fun with older kids and adults. 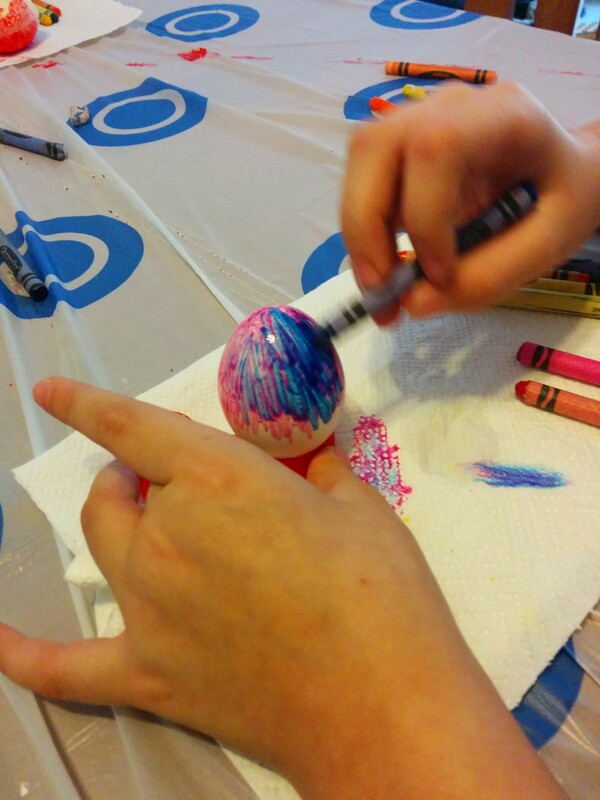 It was still tough to figure out how to color the bottom of the egg. Turning them upside down meant smudging the work. Waiting for the top to “set” meant letting the egg cool too much. So, some eggs ended up smudged, some ended up with naked bottoms. RoseArt, Chinese brand crayons, and pink crayons (even Crayola pink crayons) didn’t seem to perform well. We’ll stick with Crayola brand crayons in the future. Unless of course all we have is Chinese crayons, and then we’ll be okay with that. ‘Cuz that’s how we roll. 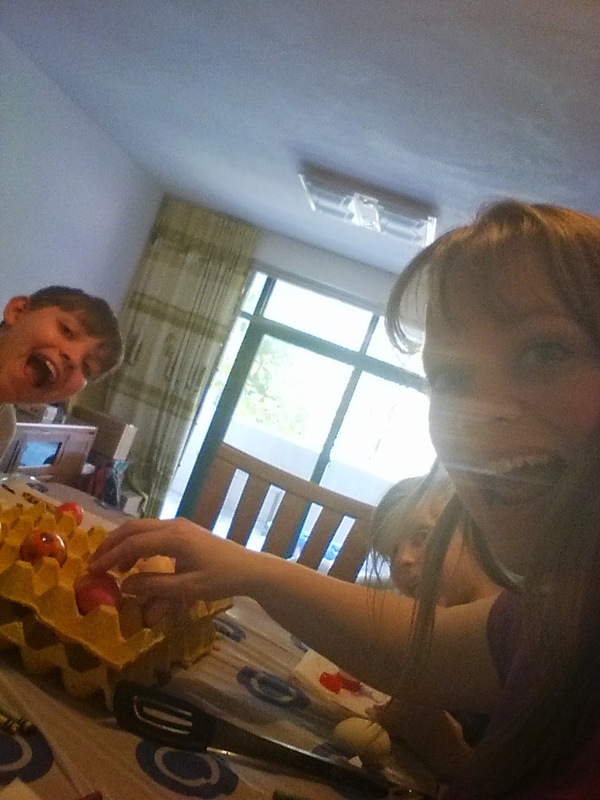 In the end, we were all quite satisfied with our beautiful and colorful eggs. The cracked ones got eaten as a snack, and the rest will be hidden among the moving boxes on Easter morning. Success! P.S. I threw away the page from the magazine. Welcome to Easter 2015.